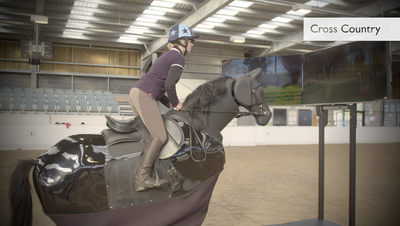 Our most advanced simulator, the Eventing simulator does it all, from true to life grand prix dressage movements like Piaffe and Passage to jumping grid work or negotiating technical combinations on our cross country course. It utilises state of the art motion control technology to replicate a 1.20 metre jump and moves in ways no other simulator can. "We have found the Eventing simulator has transformed the way we work with riders –we can’t imagine functioning without it now. Within the Margaret Giffen Centre for Rider Performance ours is used for assessment of Hartpury Academy riders, riding practice by students, confidence building for riders returning after a break, rider performance clinics, research and ‘hacking’ by our local RDA group. It is so versatile, it is in demand for everything from birthday parties to elite training camps and is used by staff, students, practitioners and coaches. 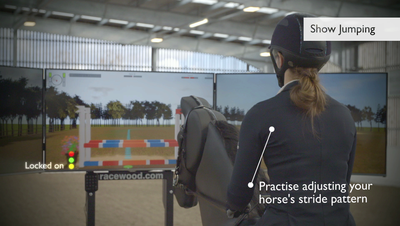 The ability to select from various ‘modes’; beginner to advanced means that there will be an activity to suit every type of rider from any discipline. I describe it as the perfect schoolmaster! " Practise Jumping within a safe and controlled environment. 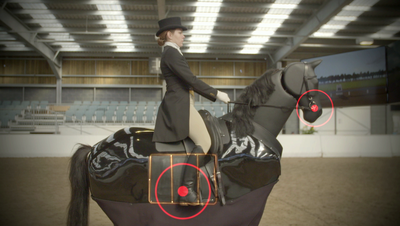 Learn to spot the stride of the horse by collecting or extending the stride pattern ahead of each jump. Our most sophisticated simulator is fully laden with sensors, providing feedback on: rein contact, balance in the saddle, leg contact. This machine is our most realistic, providing an incredibly realistic ride. Additional features include 'never ending jumps'; Instructors can vary the distance between jumps, change the style as well as the height - the rider can practise all day long!